A video highlighting the careers of three employees of The Lighthouse for the Blind, Inc.
"The Lighthouse for the Blind, Inc. is a private, nonprofit social enterprise providing employment, support, and training opportunities for people who are blind, DeafBlind, and blind with other disabilities." The Helen Keller National Center for Deaf-Blind Youths and Adults mission is to enable each person who is deaf-blind to live, work, and thrive in the community of his or her choice. HKNC is the only comprehensive national program that provides information, referral, support, and training exclusively to youths and adults who have a combined vision and hearing loss, their families, and the professionals who work with them. 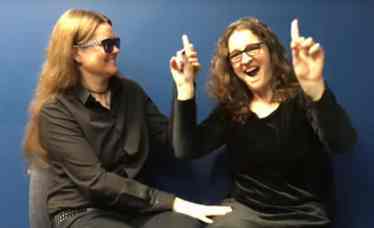 Aj Granda and Jelica Nuccio, 2 DeafBlind women, talk about the DeafBlind experience and Pro-tactile on their blog site. There are several VLOG's posted, as well as a transcription in English below the video. An article about the DeafBlind Way. Aj Granda and Jelica Nuccio's "way" is called Pro-Tactile. Nuccio, the former Director of Seattle's Deafblind Service Center and co-creator of the National Support Service Providers Pilor Project (NSSPPP) and Granda, a longtime Seattle DeafBlind community advocate and DeafBlind Community Class instructor, have come up with a formula which broadens the spectrum of communication of the DeafBlind outside of the standard Tactile with (American or any other international) Sign Language and several other manual methods.